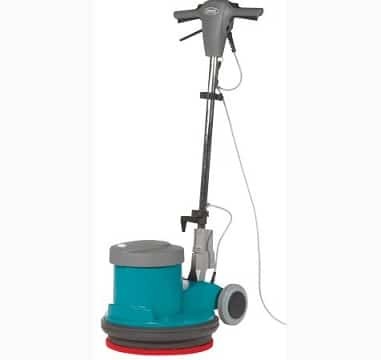 The Tennant F3 comes with a 15 metre cable, ideal for scrubbing, polishing, removing polish & intensive cleaning of industrial flooring. Removes dirt effortlessly and restores damage to coatings. Ergonomically designed this machine is lightweight, comfortable to use, easy to transport via large wheels and the folding handle ensures easy storage & transportation. The low sound level means the polisher can be used in noise-sensitive environments. The machine also has a double safety switch in order to prevent accidental starts in any position. Ergonomically designed and comfortable to use handle. Low profile of housing with off-centre motor. Safety lock and double safety switch. Quick exchange of power cable, motor and transmission. Optimal balance and easy access under desks and radiators. Increases safety, prevents starting in upright position and protects against accidental starts in any position. Easy to transport over thresholds and stairs. Prevents over heating and motor damage. Easy to control and transport. For use in noise sensitive environments.